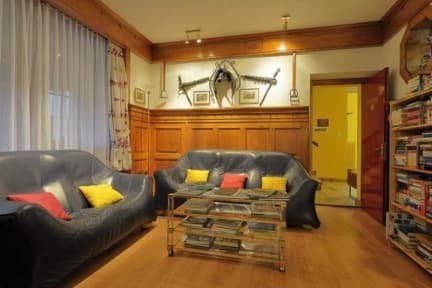 Hotel Rössli, nestling in the old quarter of Unterseen near Interlaken, is a popular base for holidays in Switzerland’s beautiful Bernese Oberland. Our hotel offers spectacular views of the surrounding mountains, a central location, a stylish yet cosy ambiance and attractive rooms to suit all tastes. Rooms with balconies have views of the snow-clad Jungfrau and the Jungfraujoch–Top of Europe at 3454 metres above sea level! City tax of CHF 3.50 per person per night is due on arrival in addition to your reservation. Please indicate all persons (incl. children) on your booking. 2 - 5 years CHF 15.--per night in existing bedding. 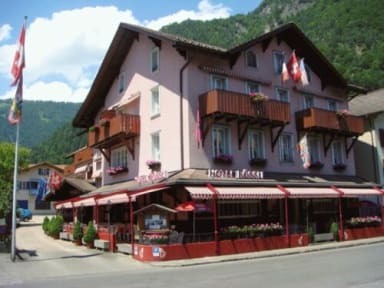 5 - 6 years CHF 20.--per night in existing bedding. 6 - 8 years CHF 25.--per night in existing bedding. INCREDIBLE!!! My experience at this hostel was incredible. The staff was SUPER kind and helpful. The hotel is in a great location (right by the Intelaken West train station). The breakfast was fresh and superb! The rooms were super clean, beds were comfortable, and the bathroom was sparkling. My private room at a spectacular view of the mountains as well!! I believe my time in Interlaken was extremely improved from this hotel alone. I recommend this place a million times over. I stayed here by myself last weekend. I had an amazing experience. Every staff member helped me and knew me by name. They helped me purchase tickets, called vendors, booked my paragliding and gave my directions and restaurant recommendations. The facilities were VERY VERY clean and the housekeepers were so accommodating bringing me a fan, before I even asked because it was an unusually warm weekend. The rooms were amazing, cool interiors with wood paneling like a cabin and a skylight.